May 3, 2011 - The United Arab Emirates (UAE) General Civil Aviation Authority (GCAA) announced a growth of nearly 9% in the total air movements in UAE airspace during the first quarter of 2011. Total air movements in the first three months of the year were 167.221 thousand, compared to 153.387 thousand during the same period last year. The UAE is home to the largest airline in the Middle East, Emirates Airline. It has Dubai as its hub, and flies to over 100 destinations across six continents. The airline was the eighth-largest airline in the world in terms of international passengers carried, and fifth largest in the world in terms of scheduled international passenger-kilometres flown in 2008. Etihad Airways, from Abu Dhabi, is also growing, with over 100 aircraft on order. The GCAA, also announced high growth rates in March 2011 when compared to last February and to March last year. This growth was noted in all air activities and operations, including air safety, security & infrastructure, air transport, licensing, aeromedical and many transactions in relation to civil aviation and associated operations in the UAE. GCAA's monthly report of March 2011 showed that total UAE air traffic movements were 58.553 thousand, an increase of almost 14% when compared to last February. Average daily air traffic movements in March 2011 were 1889, which represents an increase of 8.9% when compared to the 1734 air traffic movements in the same period last year. Dubai ranked first with 26276 air traffic movements, or almost 44.9% of total UAE air traffic movements. Over flights stood next at 12547, representing 21.4% of total air traffic movements. 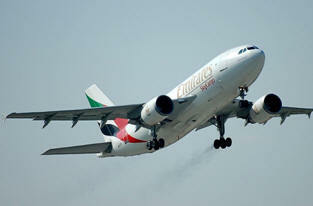 Abu Dhabi ranked third with 8310 flights, or 14.2% of total UAE air traffic movements in March 2011. According to the report, air traffic movements in Sharjah International Airport ranked fourth with 5566 movements representing 9.5% of total UAE air traffic movements. Local flights between UAE airports were in the fifth position with 4837 movements, representing 8.2% of total air traffic movements. Fujairah International Airport witnessed 347 flights, while Al Ain Airport and Ras Al Khaimah International Airport had 169 and 318 air traffic movements respectively. Al Maktoum International Airport witnessed 183 movements. The four airports together represented 1.7% of total UAE air traffic movements last March. The report indicated that as far as air safety is concerned, GCAA issued and renewed 19 certificates for aircraft maintenance companies, 9 aircraft registration certificates and 43 airworthiness certificates. Further, GCAA conducted 42 inspections and audits, issued 5 air operator certificates, completed 5 aircraft modification transactions, issued 12 simulator certificates and 20 examination permits. In terms of SAFA system 4 foreign aircrafts and one air operator were suspended, and for (ROSI) system 55 aviation incidents were reported. As for security and infrastructure operations, GCAA conducted 18 inspections and audits of hazard material shippers, prepared 220 airport control tower reports, and held 48 internal and external meetings in relation to security and infrastructure operations with several institutions and companies operating in the field of civil aviation in the UAE. In spite of the current conflicts in the region, the UAE achieved a growth of 9% in the first three months of the year. This highlights the success of the UAE in maintaining high level of stability amid the current conditions and challenges. Air traffic is a strong indicator of the UAE's ability to maintain its advantages at all levels, which forms a strong ground for starting the development of policies that encourage manufacturing in civil aviation in the United Arab Emirates."